So, you’re planning an outdoor event, perhaps a wedding reception or an anniversary celebration. The first thing that you’re likely to have arranged is the key infrastructure. For the majority of outdoor events nationwide, the goal is to have a top-of-the-range marquee as a central hub for the event. There are so many ways to make your event sparkle, but have you considered a marquee fireworks display? As you know, nowadays there are so many excellent features that can be incorporated within modern marquees. At hand are ‘state of the art’ power + lighting solutions, quality flooring solutions and teams of experts who can decorate the interior to match the events theme. Furthermore, it has never been easier to include top-quality caterers and a fully-operational drinks bar within the marquee itself to make sure that your guests are looked after. Most people’s experience of professional firework displays tend to be from Bonfire Night and New Year’s Eve events, enjoying the pyrotechnics among thousands of other guests. Steeped in tradition, these displays are great showcases of the latest pyrotechnic effects, often set to a soundtrack with a dramatic bonfire in the background. Whilst these displays are thoroughly enjoyable and very well-received, we find that organising a professional display for your own private event adds a special element of intimacy to the show. The experience of enjoying the fireworks in a smaller, closer-knit crowd is completely different to that of the bigger, public displays. Being in a smaller crowd, you feel more connected to the display, with each firework feeling more dramatic, filling up your senses. Just imagine wondering outside of your marquee with friends and family to be greeted with an incredible firework display, just for you. Anyone who has experienced this at a wedding, anniversary or birthday event will be able to tell you how special this moment is! Adding personal elements to your event is so important. 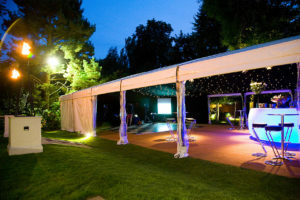 Given that you’ve probably themed your marquee to match the occasion, why not extend this theme to your entertainment? 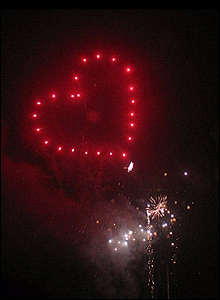 Many are unaware of how creative you can get when designing a firework display. With a vast range of different colours, effects and more at our disposal, there is truly no theme that can’t be implement into a firework display. By liaising with a team of designers who plan each display individually, you have a great opportunity to give creative input into how the display will look. If you’re getting married, why not ask for some heart-shaped effects? If it’s a company event, why not ask for fireworks with certain colours to match your logo and branding? Whatever the occasion, we can help you celebrate it. The best Marquee Hire companies have the ability to install high-quality audio systems to keep your guests dancing all night. With this equipment sourced and your firework display arranged for later in the evening, everything is in place for a ‘pyro-musical’ show! By setting the firework display to your choice of music, we can create an unforgettable experience for you and your guests, free of charge! With the dancefloor and P.A. System tucked inside, this marquee would be great to watch a display from. Our firing system can fire the effects in time with the music down to a 100th of a second. The fireworks are in sync with the rhythm of the chosen music, with larger effects bursting at high-impact moments of the songs. It’s an incredible experience. Understandably, it may initially seem like a lot of work to organise everything, from the venue to hospitality and entertainment. However, by working with experienced companies and own their trusted suppliers, you can let the professionals do the work for you. 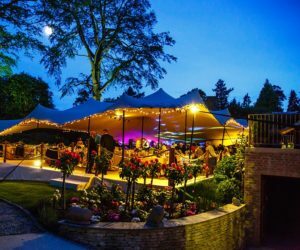 Working with a company such as Inside-Outside Marquees and their suppliers, we’ll complete site visits and Risk and Method Statements to ensure the event goes off without a hitch. Essentially, if you want a firework display for your event, just tell us and we’ll make it happen. Of course, if you’d like more involvement in the planning of the event, your creative input is always very welcome! Unforgettable moments for your special events! Finally, it’s worth reaffirming the special nature of firework displays. Incorporating one into your event gives it an extra-special touch that your guests will remember for years to come. 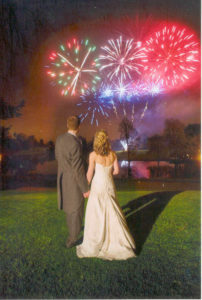 Whether it’s a wedding, birthday, anniversary or corporate event, you can be sure that everyone will remember the firework display! 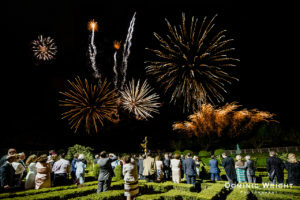 As you can see, a marquee-based event can be incredibly well complimented by a firework display. 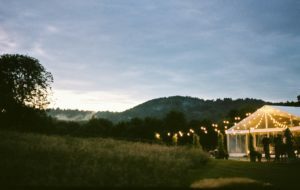 For all your marquee needs, we would recommend using the excellent Inside Outside Marquees to bring your event to life. With an extensive supplier list as well as decades of experience in the industry, you will know that your event is in safe hands. Inside-Outside Marquees can be contacted via there website, here. To organise your firework display, Fantastic Fireworks are always here to help. So, give us a call on 01582 48555 or email us at [email protected] to find out more and plan your display!